I’m almost positive that someone from Ubisoft is spying on me. They must be sneaking into my room at night and listening while I ramble in my sleep. They’re probably tracking everything I do, everything I say, everything I write... How else would they know to make a game like Rayman Legends? In tNovember of 2011 Rayman Origins launched to rave reviews. Unfortunately Ubisoft released the game alongside their newest title in the Assassins Creed series, Assassin’s Creed Revelations. Even though the critics loved the new Rayman there wasn’t much of a mad rush from gamers to go nab the amazing platformer. As a platformeing maniac, Origins did catch my eye from the start, but I waited until Black Friday to nab it on an Amazon lightning deal. The rest is history. Beautifully animated, wonderfully orchestrated and fantastically designed history. Orgins remains one of the only games that has been produced in the last few years to make my coveted top ten list. Legends is the direct sequel to Origins and retains much of the same feel and look. Here are some reasons why the game is looking like it could end up being my favorite game ever. Keep in mind that I haven’t actually played the finished game yet (obviously). I have played the Wii U demo, the challenge app, and I had the chance to play it this last summer at E3 2012. Let’s be honest, there aren’t as many big budget 2D platformers as there used to be. The days of the Genesis and SNES are, sadly, over and a platformer of this magnitude doesn’t come along every day. There are really just three things you have to work about - running, jumping and punching. Sure there are some more advanced moves, like hovering and wall running, but the game is a good old hop and bop at heart. I’m a sucker for hand drawn, multi layered backgrounds. Legends is just that. I mean look at it! LOOK! Smash your retinas into the picture at the top of this article. I’ll just wait here. Amazing, right? And that picture below? Wowzers. The animations and character designs are beautiful in every way. It’s chill. It’s upbeat. It’s western. It’s jungle. It’s a mother fluffin’ didgeridoo! 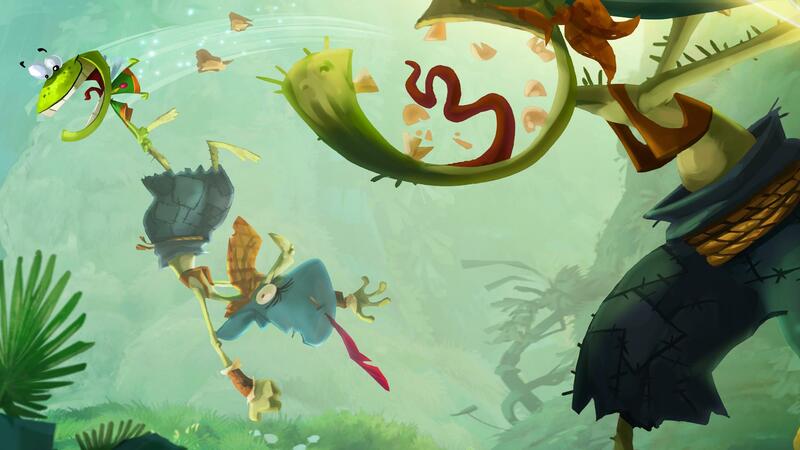 Rayman Legends, like Origins, is audio bliss. The mood of the levels is perfectly represented in each enviroment. Have a listen to some of the best Origins has to offer. It seems that the the multiplayer aspect of many games is a selling point now a days. 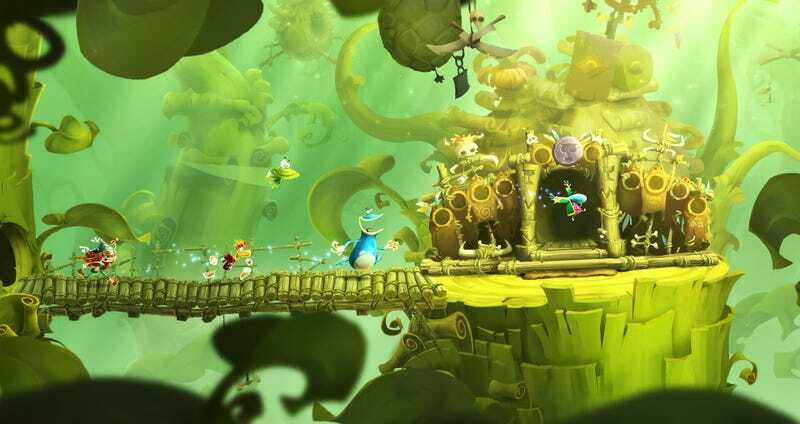 Though Rayman is a fun solo adventure it becomes even more exciting with the addition of a few pals. My wonderful wife isn’t really drawn to games that don’t have the words “Animal Crossing” or “LEGO” in them. That being said she loves to help out in games like Super Mario Galaxy and and Legend of Zelda: Skyward Sword. In Galaxy 2 she controlled Mario’s little star buddy and enjoyed her ability to help, but still not interfere too much. Rayman Legends handles this type of multiplayer perfectly. One player controls Murphy, Rayman’s goofy buddy, to highlight lums and move obstacles out of the way. I very much enjoy gaming with my wife, so this is a big draw for me. This stunning combinations of art, music, and gameplay is just the game I’ve been waiting for. Let’s hope it has a hundred levels, online play, and an endless assortment of additional content. August can’t get here soon enough.